They pop up at Yamaya sometimes , but you make a good point, not as often as Suntory whiskies. This is a "world" blend, right - "The new blend will feature liquid from distilleries located in the five largest whisky-making regions around the world, namely Scotland, Japan, Ireland, Canada, and the USA. Suntory and it's US arm, Beam Suntory, own a large number of distilleries, including Laphroaig, Bowmore, Tyrconnell, and many other brands." Which also includes Jim Beam, Knob Creek, Maker's Mark and Canadian Club. Ao might tastes exactly like pouring some Jim Beam into a glass of Yamazaki. It might taste like mixing your Hibiki with your Knob. omarr and DGibb like this. Couldn't find an answer on this but are the Hibiki 21 LE (Kacho Fugetsu) only available at Tokyo and Osaka airports exclusively? And not other airports or retailers in Japan or worldwide? Yes, or duty free shops in Tokyo. Whats availability like for it out of curiosity? Assuming its quite variable. Have the H17 Kacho and would very much like to add the 21 to the collection. Any idea if availability is better at these Duty Free stores than at the airport? Airport is better, DF shops in the city are usually sold out. Was able to grab 4 Hibiki Kacho at Narita today, they just have slips now for each bottle and you take one and pay at the counter. I guess they got tired of telling people how many are left! I was there at noon but don't think it matters too much. The shops don't re-stock every morning as some people suggest. 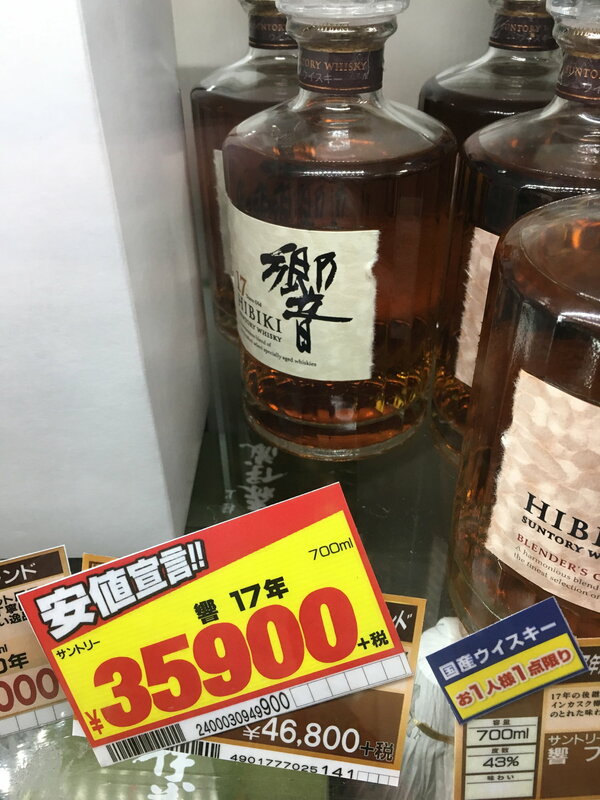 Any sightings of hibiki 17 anywhere in Tokyo?